We are excited to introduce you to our last finalist from the #NextLadyLegends campaign! Remember, beginning the week of March 20th YOU will have your chance to vote for our NATIONAL WINNER! Read more about this campaign here, read ALL of our finalist interviews here and check out the action on twitter using #NextLadyLegend. For our last Finalist of our #NextLadyLegends contest, ScoreStream wanted to showcase someone that had shown heart, determination, and an attitude of perseverance. 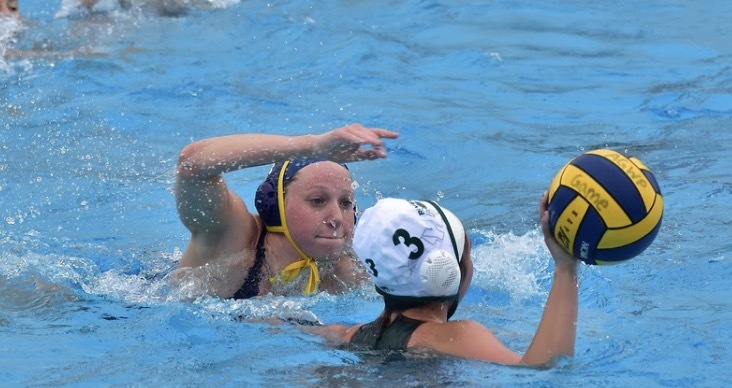 As we scoured the nation, we found ourselves casting our attention in to the deep blue pool of the Arroyo Grande’s Water Polo team. There we found senior center, Isabella Solis. No more than a year ago, Solis was dealing with an injury and was forced to miss the playoffs her junior year. If any of you have dealt with an injury, it can be both frustrating and demoralizing. However, that wasn’t the mindset of Solis. 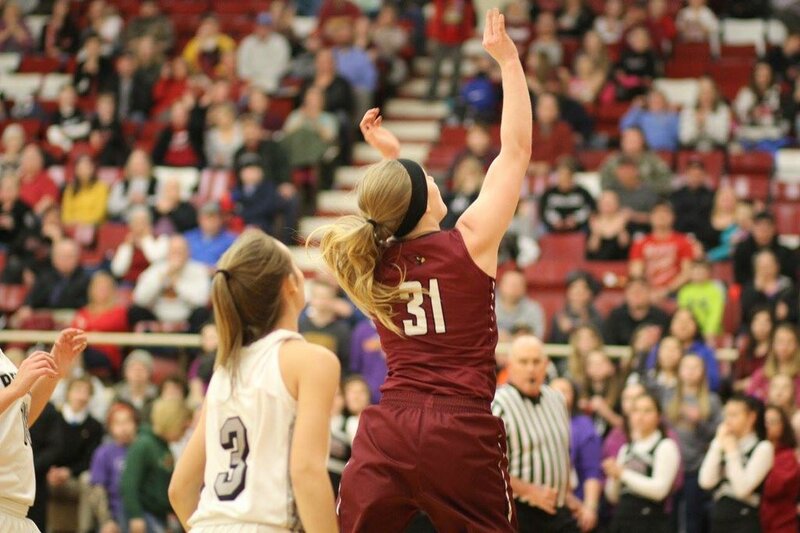 She worked throughout the off-season to come back and was able to lead her team her senior season. With Solis’s help, Arroyo Grande’s Women’s team posted a 19-7 overall record and were able to win their 13th consecutive league title led by Solis scoring 50% of the goals in the league championship game. After their impressive season ScoreStream was able to catch up with her to ask her some questions we thought our viewers may have. SS: How did you begin playing sports? IS: I started out playing sports when I was very young, around 5-6, I played basketball all the way from kindergarten to eighth grade. 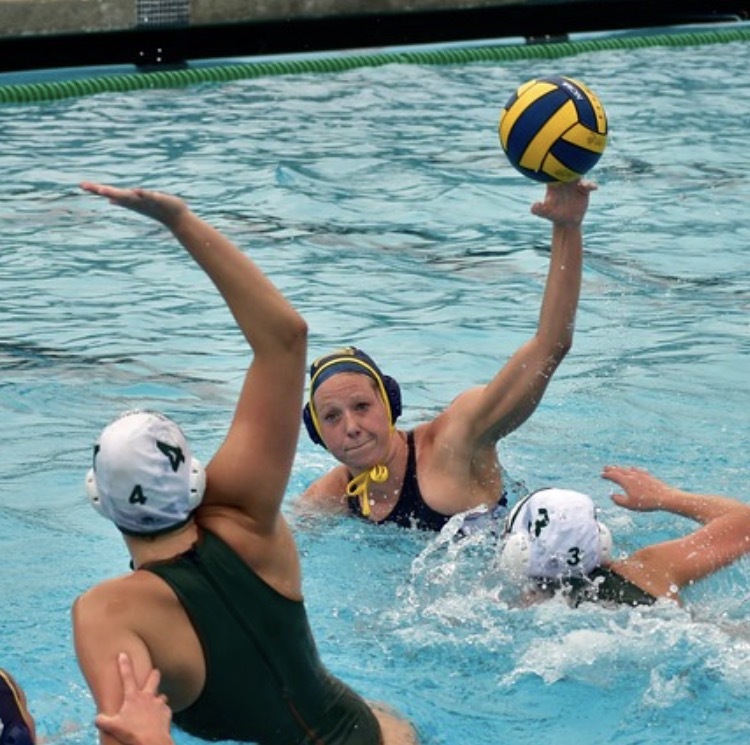 But then my freshman year I was introduced to the sport of water polo. I have stuck with it ever since! SS: If you were going to choose one emoji to describe yourself, what would it be and why? IS: I would be the crying laughing face emoji 😂 because my team and I are always laughing! SS: What female in your life is the most inspirational? IS: My mom is the most inspirational female in my life because she is my number one fan and cheerleader! I know that life can be hard but her presence always motivates me to keep pushing through and always try your hardest! SS: Do you have any pre-game rituals to get you pumped up for game day? IS: I always try to stay relaxed before games and keep it loose! My goal is to play a calm and collected game, and I prepare accordingly hoping that everything runs smoothly! SS: What players or coaches have most influenced you to be the player you are today? IS: All the coaches that are involved in the Arroyo Grande Water polo team have played a part in influencing me as a player. I have to say Catherine Gritton, who is a volunteer coach for our team. She has truly encouraged me and helped me really develop as a person and as a water polo player. It has really been a blessing to be involved with the program and have her and our head Coach, Steven Allen, leading the way for us. We are excited to introduce you to our next finalist from the #NextLadyLegends campaign! We will continue to release interviews for each finalist, and beginning the week of March 20th YOU will have your chance to vote for our NATIONAL WINNER! Read more about this campaign here, and check out the action on twitter using #NextLadyLegend. ScoreStream is happy to announce the next stellar nomination for our #NextLadyLegend feature, Caitlyn Cota from Bishop Alemany High School in Mission Hills, CA. Cota is a threatening dual athlete who plays big roles as a captain on both her high school soccer and volleyball teams. She led her volleyball team to the CIF Semi-Finals and a state championship regional runner-up title her Senior year for the first time in program history. Cota recorded 52 aces and 323 digs on the season as the libero. She then quickly switched gears into her senior soccer season and also led her soccer team to the CIF Semi-Finals, scoring four goals on the season and earning Co-Best Defensive Player! ScoreStream got to know this multi-sport legend in making during the Q&A below. SS: What lessons have you learned from soccer and volleyball that you carry along in every day life? CC: The lessons I have learned from these sports is to be tough and strong no matter what life throws in my path. If I cannot do that, something I learned from my volleyball coach is to “fake it ’till you make it”. Another lesson I live by is “one more”, which helps me persevere and keeps me motivated to push ahead when I might feel like giving up. My soccer coach wrote this on a white board after practice one night, and it has stuck with me ever since! SS: What emoji best describes you and your teammates and why? CC: I would definitely have to say the 💃🏽 emoji because before every volleyball and soccer game we like to listen to music and dance in the locker room. It is part of our routine and really fires us up for the game. I have the best memories from our crazy locker room parties! SS: What female athlete do you think is changing her sport? CC: I think an athlete that is changing ALL sports is Serena Williams because she firmly believes that women should always be judged by their achievements, not their gender. Williams once said, “People call me one of the ‘world’s greatest female athletes’. Do they say LeBron is one of the world’s best ‘male’ athletes? Is Tiger? Federer? Why not?” Women never truly get the same recognition or respect as male athletes, and I think Serena Williams is doing her best to change that. SS: What is the most memorable moment of your high school athletic career? CC: One thing I will never forget about high school athletics were the play off game bus rides. We would usually nap on the way to the game, but on the way home we would blast music and sing until our throats hurt! Those bus rides were where we connected with one another and made memories that will last forever. I will also always remember the overwhelming support we had from our school’s fan section, the “Warzone”, at CIF soccer Semi-Finals this year. Hearing other athletes and friends from my school cheer for us made me feel so supported, and even though I was sad it was my last soccer game, I will never forget the love and support I felt that night. SS: How do you balance being a two sport athlete while excelling academically? What is your secret? CC: How do I balance both high school sports, club volleyball, and school, along with making time for myself, my family, and my friends? My crazy and hectic life has taught me how to manage my time effectively and how to stay organized. I also think that loving both sports and my teammates has helped tremendously. I have learned both from academics and sports that when you work hard you will achieve greatness. I play volleyball and soccer because my love for the game continues to grow every day. I also would not be the student or athlete I am today without my friends and family cheering me on, and the endless support and love that my fellow classmates give me. My secret to balancing everything is to not do it alone! I know that I always have my friends, family, teammates, and classmates by my side. SS: What is a fun fact about you that not many people know? CC: Some fun facts about me are that I have never had a bloody nose, I collect cool socks, I’ve broken four bones, I’ve donated to Locks of Love twice, and I was named female athlete of the year in my eighth grade class! I was also named Senior Class Homecoming Queen this year 👑. You can keep up with Caitlyn’s soccer and volleyball teams at Bishop Alemany High School on ScoreStream! 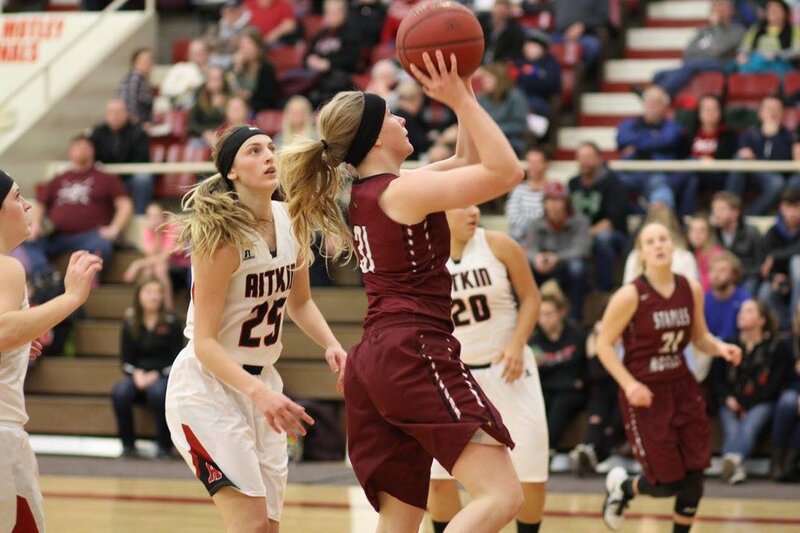 ScoreStream is thrilled to present Amber Robben from Staples-Motley High School in Staples, MN as our #NextLadyLegend finalist! Robben is a senior captain on her high school basketball team who plays the essential role of point guard, and can be described as “unselfish and fast” out on the court. She has been playing basketball since the fourth grade, has fallen in love with the game, and never second guessed her decision to start playing. Part of what makes Robben a stand-out lady legend is her proven ability to overcome obstacles and take on challenges with resilience. Between 8th grade and her freshman year, Robben suffered a devastating ACL tear that she described as “one of the hardest things that’s ever happened to (her)”. Although it wasn’t easy, she was able to recover from this injury and come back even stronger to excel in her high school career. We scored a Q&A with Robben and got to learn more about her and her passion for basketball! SS: Are there any female OR male athletes that you look up to for inspiration? AR: One athlete I really look up to is my coach, Craig Wolhowe. He always knows what to say to me when I need direction physically or mentally, and he is the most kind-hearted person I know. SS: It’s GAME DAY! What is your method for getting in the zone? AR: On game days, I like to think about the little things we worked on in practice that week and how I’m going to apply them to the game. In the locker room before every game, my team and I carry on a tradition of chanting to get us pumped up. Lastly, I like to pray twice before heading out to the court! SS: If you had to choose an emoji to describe you, what would it be? AR: I would choose the smiling emoji 😄 because I’m always smiling. A big part of basketball is all about having fun and enjoying your time out on the court. SS: When you’re not playing basketball what is your favorite activity? AR: My favorite activity outside of basketball is definitely hanging out with my friends and family. It’s important to spend quality time with those closest to you. SS: As a female athlete, do you think there are any misconceptions about girl’s sports? AR: I’ve heard many negative things about girl’s sports that aren’t true. I hear that girls basketball is “boring to watch”, that we play at a slower pace, and that girl’s sports just aren’t fun. My team and I try to play the best basketball we can, and if anyone with these thoughts came out to watch us we would prove them wrong. SS: What is your go to signature move out there on the court? AR: My go to move is going behind the back or a step back shot 👌🏼. You can follow Amber Robben on twitter @amber_robben31. Make sure to keep up with her basketball team and other sports at Staples-Motley High School on ScoreStream! We are excited to introduce you to our next finalist from the #NextLadyLegends campaign! We will continue to release interviews for each finalist, and beginning the week of March 20th YOU will have your chance to vote for our NATIONAL WINNER! Read more about this campaign here, read ALL of our finalist interviews here and check out the action on twitter using #NextLadyLegend. From the San Luis Obispo County, California, ScoreStream is proud to present to you our #NextLadyLegend finalist Taylor York. York is Arroyo Grande’s secret south paw’d weapon. She is a counter attack specialist that has an innate ability to simply “out-swim” the opposition. We were drawn to her through a video we found of her nailing a cross cage top corner bar in! After she helped her team post an incredible 7-0 league record we were able to catch up with her and ask her some aquatic questions we thought some of our viewers may have. TY: I began playing sports in first grade when my parents signed me up for soccer. I was definitely competitive but I quickly found out that I am not much of a “land animal”, I have weak ankles and terrible balance. 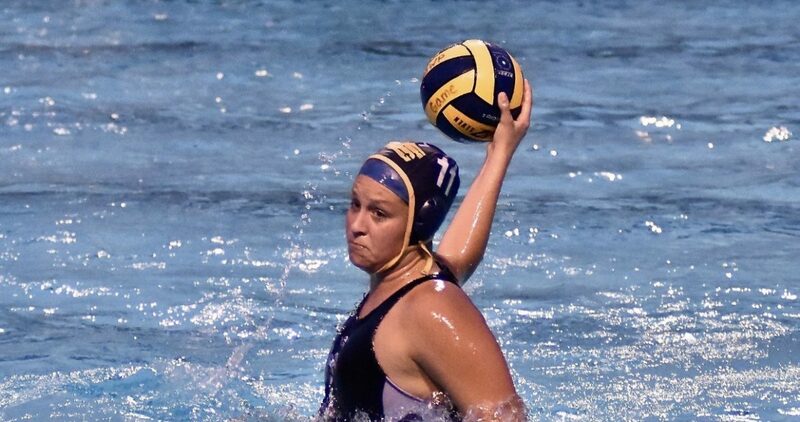 It wasn’t until my freshman year that I decided to walk onto the water polo team and I’ve been hooked ever since. SS: What do you think of when you think of Women’s History Month? TY: When I think of Women’s History Month I think of female empowerment. Sometimes I find myself taking for granted the struggles that Women through history have endured in order to give me the life I am able to live today. Without them, I wouldn’t be able to compete on a sports team or be able to be a leader with a voice. If it wasn’t for The Women’s Suffrage Movement and every woman who stood up, my life would be drastically different. TY: My mom is the most inspirational female in my life because she is a natural born leader. She has a gift of getting people to rally behind a certain cause to better the community or our future. Above all she cares about every single person and puts everyone else’s needs above her own. SS: Any emoji that describes you and your teammates? TY: If I had to pick one emoji to describe my my team it would be 😂. At times we can be incredibly serious but one of the things that set us apart from other teams is how close we are and our team dynamic. We really had an incredible ability to come together and have the best time with each other. SS: It’s game day, what is your go to method for getting in the zone? TY: My go to method for getting in the zone is to visualize myself making plays, that helps me really think about what I’m doing and prepare mentally for the game. It reminds me of what to do in certain situations to optimize scoring opportunities. SS: What is your go to method when creating a scoring opportunity? TY: My method for creating a good scoring opportunity is to gain a positional advantage and then out swim the opponent. Speed is my specialty, and that usually creates a good counter attack scoring opportunity. You can keep up with York and Arroyo Grande on ScoreStream! In the past, the bulk of ScoreStream’s #NextLadyLegend finalists were signed, committed, and just about ready to leave for the college of their choice. However that isn’t the case for our next finalist. 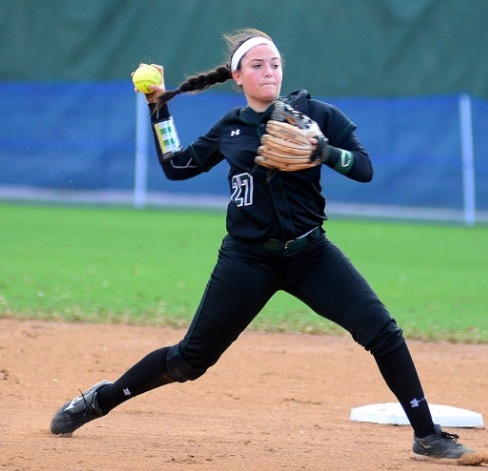 Only a sophomore at Tampa Catholic, Alexa Russo has already accumulated multiple Division I offers by regularly proving to be a unique athlete. In her freshman year, she posted an impressive .542 batting average with 3 home runs and was named the MVP of her class! As a Sophomore, she is currently batting .667 with 1 home run. We were recently able to speak to Alexa’s High School coach, Jackie Hirschfeld. 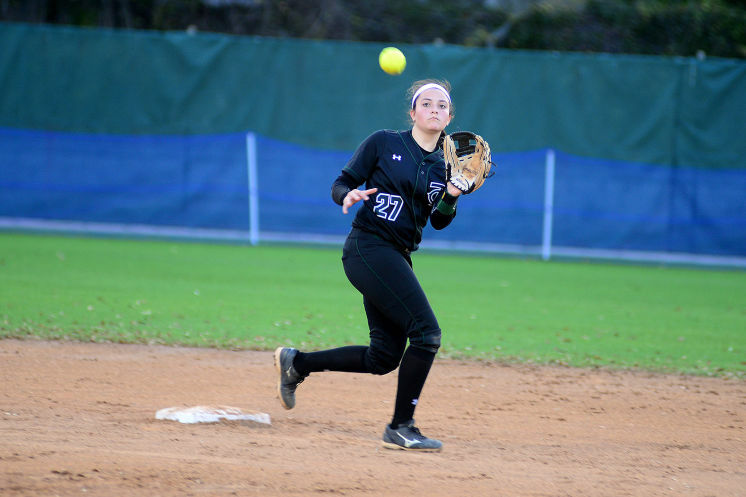 She described Alexa as, “A natural born leader both on and off the field…that has been flawless this year.” After talking with her coach, we knew we had to catch up with Alexa and inquire with her about the pandemonium she is creating! AR: I began playing baseball when I was about four years old. Around that time, my mom also enrolled me in a ballet class. After that class, I had to break the news to her that I wanted to be on the field and not in the studio. My father and uncle both played professional baseball, so naturally I grew up around the sport and was always surrounded by ball players. I played for my dad and uncle in the their travel-ball league until I was in the 7th grade. After that I made the switch to playing softball. SS: When you think of Women’s History Month what comes to mind? AR: I think of the all iconic women we know today. Each one of them fought for women’s rights during a time when the odds were definitely stacked against them. Because of the strides they made, women in today’s world have the opportunity to make a larger impact in society than ever before. SS: Favorite professional female athlete? AR: Jennie Finch! She is my favorite female athlete because she has worked extremely hard and is deserving for all of her accolades. I really look up to her because she knew how to control the game and she was the first women’s softball player that I watched compete. SS: What lesson have you learned from playing that you carry along in every day life? AR: You need to work hard for anything you want in life. I always try to remember that I can do anything I set my mind to! Especially when the odds are against me, I just remember to keep fighting. You can always come back and win if you are down. AR: I try to stay loose, have fun, and hang out with my teammates. Sometimes there can be a lot of pressure associated with playing sports. I just try to have fun and motivate my teammates in anyway I can. SS: Is there any emoji that describes you and your teammates? AR: My teammates and I are always laughing and having a great time together. We do our best to stay lit and as a unit we make a lot of priceless memories both on and off the field!